Right of way is a term used to describe "the legal right, established by usage or grant, to pass along a specific route through grounds or property belonging to another", or "a path or thoroughfare subject to such a right". A similar right of access also exists on some public land in the United States and Canada, as well as Australia and New Zealand (where such land may alternatively be called Crown land). In some countries, especially in Northern Europe, where the freedom to roam has historically taken the form of general public rights, a right of way may not be restricted to specific paths or trails. Alternatively, the right of way may be limited. When one person owns a piece of land which is bordered on all sides by lands owned by others, a court will be obliged to grant that person a right of way through the bordering land. Footpaths and other rights of way in most of England and Wales are shown on definitive maps. A definitive map is a record of public rights of way in England and Wales. In law it is the definitive record of where a right of way is located. The highway authority (normally the county council, or unitary authority in areas with a one-tier system) has a statutory duty to maintain a definitive map, though in national parks the National Park Authority usually maintains the map. Definitive maps of public rights of way have been compiled for all of England and Wales as a result of the Countryside and Rights of Way Act 2000, except the 12 Inner London boroughs which, along with the City of London, were not covered by the Act. To protect the existing rights of way in London, the Ramblers launched their "Putting London on the Map" in 2010 with the aim go getting "the same legal protection for paths in the capital as already exists for footpaths elsewhere in England and Wales. Currently, legislation allows the Inner London boroughs to choose to produce definitive maps if they wish, but none do so". Some landowners allow access over their land without dedicating a right of way. 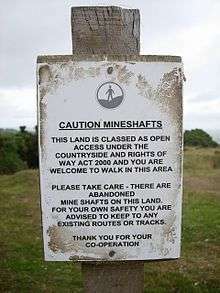 These are often indistinguishable from public rights of way, but they are usually subject to restrictions. Such paths are often closed at least once a year, so that a permanent right of way cannot be established in law. 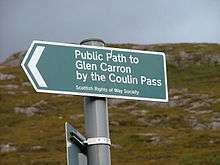 In Scotland, a right of way is a route over which the public has been able to pass unhindered for at least 20 years. The route must link two "public places", such as villages, churches or roads. Unlike in England and Wales there is no obligation on Scottish local authorities to signpost or mark a right of way. However the charity Scotways, formed in 1845 to protect rights of way, records and signs the routes. There is no legal distinction between footpaths and bridleways in Scotland, though it is generally accepted that cyclists and horseriders may follow rights of way with suitable surfaces. The Land Reform (Scotland) Act 2003 gives everyone statutory access rights to most land and inland water in Scotland, to non-motorized traffic, making the existence of rights of way less important in terms of access to land in Scotland. Certain categories of land are excluded from this presumption of open access, such as railway land, airfields and private gardens. claimed – other routes, which have not been vindicated or asserted but which appear to meet the common law conditions. In England and Wales public access rights apply to certain categories of mainly uncultivated land—specifically "mountain, moor, heath, down and registered common land." Developed land, gardens and certain other areas are specifically excluded from the right of access. Agricultural land is accessible if it falls within one of the categories described above (See Countryside and Rights of Way Act 2000). Most publicly owned forests have a similar right of access by virtue of a voluntary dedication made by the Forestry Commission. People exercising the right of access have certain duties to respect other people's rights to manage the land, and to protect nature. Much of Canada is Crown land owned by the provinces. Some is leased for commercial activity, such as forestry or mining, but on much of it there is free access for recreational activities like hiking, cycling, canoeing, cross-country skiing, horse back riding, and licensed hunting and fishing, etc. At the same time access can be restricted or limited for various reasons (e.g., to protect public safety or resources, including the protection of wild plants and animals). In the Canadian Territories Crown land is administered by the Canadian Federal Government. Canadian National Parks have been created from Crown land and are also administered by the Federal Government. There are also provincial parks and nature reserves that have been similarly created. The aboriginal peoples in Canada may have specific rights on Crown land and have claimed ownership of some Crown land. ↑ New Oxford American Dictionary. ↑ Henry Campbell Black, "Right-of-way", Black's Law Dictionary (West Publishing Co., 1910), p. 1040. ↑ Devaughn, Melissa (April 1997). "Trail Etiquette". Backpacker Magazine. Active Interest Media, Inc. p. 40. ISSN 0277-867X. Retrieved 22 January 2011. ↑ "Naturenet: Rights of Way Definitive Maps". Retrieved 13 November 2016. ↑ "Search - Lambeth Council". Retrieved 13 November 2016. 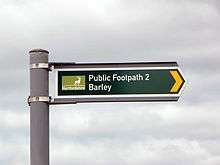 ↑ "Everything you need to know about Rights of Way". 24 August 2011. Retrieved 13 November 2016. ↑ Scotsway: The Scottish Rights of Way & Access Society. ↑ "Scottish Outdoor Access Code". Retrieved 13 November 2016. ↑ "Access - Useful Info - Walk NI". Retrieved 13 November 2016. ↑ A Guide to Public Rights of Way and Access to the Countryside: . ↑ Lissadell owners' case, reported Jan 2010; and a group opposed to the current laws. 1 2 "Kia Ora, Welcome". Retrieved 13 November 2016. ↑ Right to roam in Norway: . ↑ "Lands". Retrieved 13 November 2016. ↑ "S.O.U.L.". Retrieved 13 November 2016. ↑ "New foreshore bill passed". Television New Zealand. 24 March 2011. Retrieved 30 July 2012.